Come Ride Horses in Kentucky! Learning to ride horses at First Farm Inn means communicating with your new equine partner in ways he can understand. Unlike traditional “trail rides,” at First Farm Inn we actually direct and communicate with the horse. Horseback riding also means learning to balance so your horse can trust you. Since horses have the second longest memory in the mammal kingdom, after elephants, understanding their history helps you understand them. Here are short bios of our riding horses. A gentle giant, Bode was born 6-16-99 and is registered as Bodacious in the Spotted Draft Registry. Bode is our herd leader at 16 hh and about 1500 pounds, depending on the season. He joined our herd in ’05. Bode has a round back and is very sensitive to balance so he doesn’t tolerate out-of-balance or inconsiderate riders well. Kind and courageous, he will go through or over anything and look out for his fellows. While some riders are intimidated by his size, Bode generally inspires confidence. Koda is an opinionated little guy who was a wild mustang captured in Nevada by Bureau of Land Management and auctioned in ’99. He has double rows of scars down both his sides. Likely he was tangled in barbed wire by an “adopter” in the Kentucky-Indiana-Ohio region before came to us. He was probably young when captured, but his teeth look like he’s in his 20s. Koda is a 13.3 hh bay “dun,” which means he has dark points (legs, mane, and tail) and a dorsal stripe. He arrived on 12-23-13. Despite having the shortest legs in the herd, his attitude keeps him up with or passing long-legged Buster. He’s a “forward” horse and moves quickly. Second in command, he enforces the herd hierarchy with his teeth. 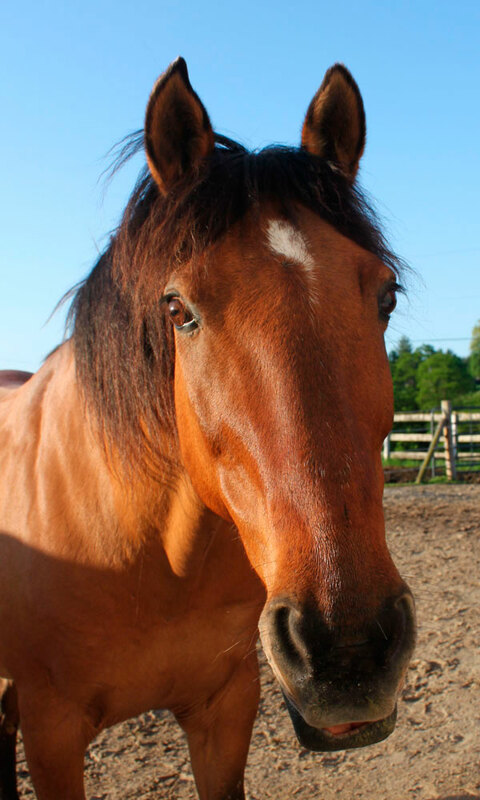 Our oldest horse, Sundance Master “Sunny” is a registered half-Arab and Quarter-Horse gelding. Born 4-24-93, he’s bay (red-brown with black mane & tail) 15.2 hh and 1050 pounds. While Sunny has lots of training in several disciplines, he’s the “barn potato” who prefers to hang out by the hay feeder and do as little as possible. He’s our beginner rider horse who prefers to follow the crowd, avoiding as many hills as possible. 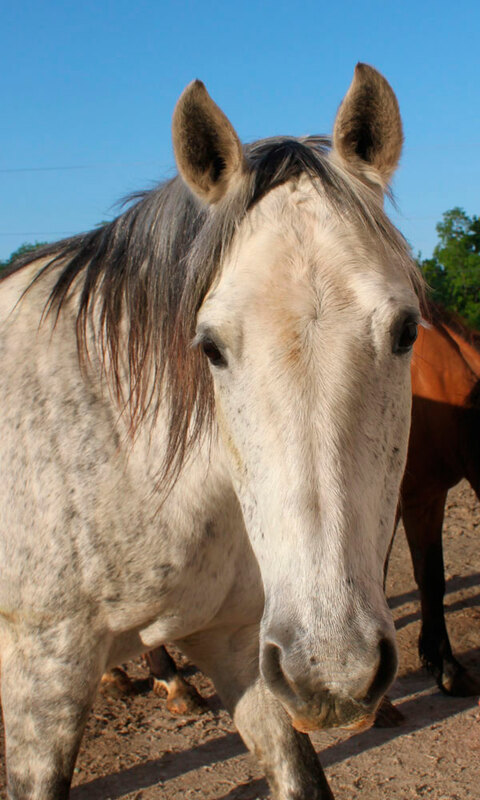 Blue Romeo is a blue roan Morgan-Quarter Horse, 15 hh and 1,000 pounds. Born in ’06, we brought him home from London, KY in ’09. His color lightens or darkens each time he grows a new coat. Loved by experienced riders, with inexperienced riders Blue is a champion slacker. He has some dressage training. Diagnosed with low thyroid in 2017, he’s on meds, but always thinks he’s hungry and focuses on sneaking snacks whenever he can. 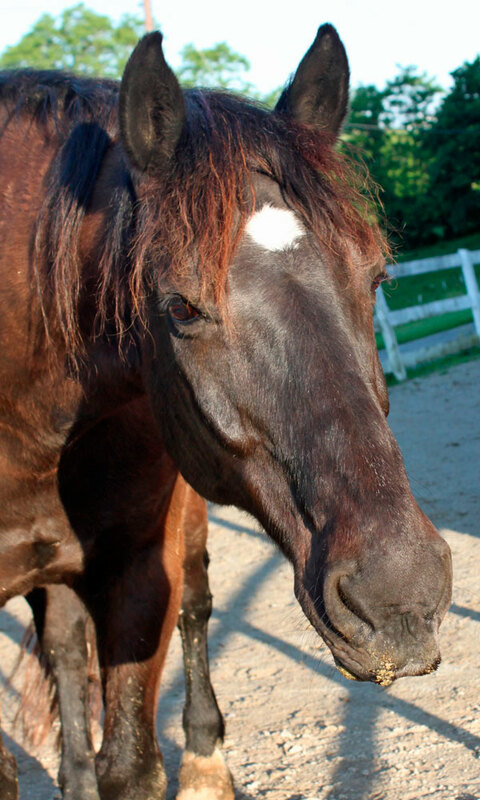 Buster Brown is a Percheron-Thoroughbred cross, chocolate brown with a star, 16.3 hh and 20 years old. His mother was taken away when he was four days old to nurse a Thoroughbred, but he was adopted by a “nurse-mare foal” rescue and bottle fed. His training began at 2 with a local woman who gave him great care until medical problems forced her to sell him to us in 2011. He thinks he’s a kitten and loves treats. A well-trained and talented dressage horse, Buster is better with an experienced rider who knows how to sit quietly and post. Inexperienced riders often inadvertently cue him too strongly, confusing him. 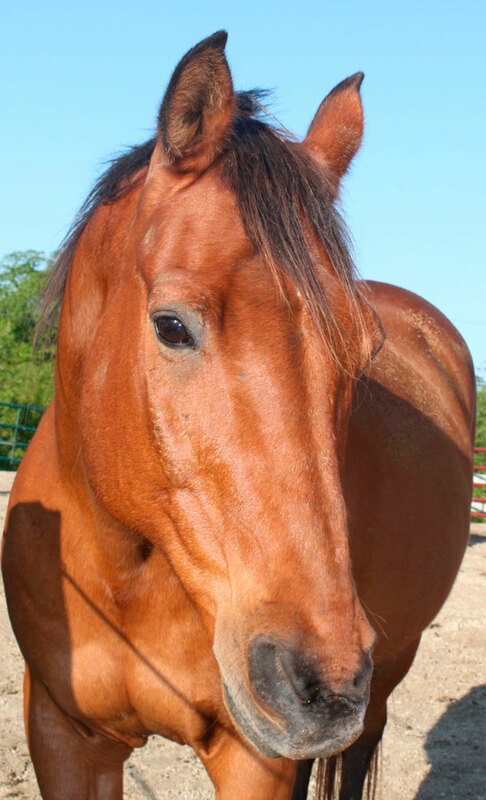 Chance is a 15.2 hh 10-year-old chestnut Quarter Horse bred and raised by a friend in Boone County. Trained to be a Western Pleasure horse, Chance is an experienced trail horse. Like Buster, he hasn’t had bad experiences to give him frightening memories — unlike the rescue horses we’ve had. Coming from the herd he was born into, he doesn’t have good horsey manners like a horse who has been schooled by assertive herd-mates. Newest in the herd, he prefers to follow and wants to get closer to the other horses than they’d like. Staying a horse’s length apart is always safest and prevents problems.